For those with disabilities, using a stairwell in the West Front Street library is out of the question in a building with no elevator. 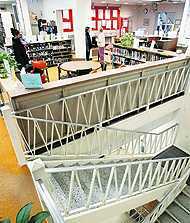 However, borough officials say they are working to correct those deficiencies with a $1.7 million renovation plan. RED BANK -- In a wheelchair, one can only get so far inside the Eisner Memorial Red Bank Public Library on West Front Street. On the ground level of the building, the book stacks are too narrow to accommodate a wheelchair. There is no elevator leading downstairs, where the children's department, community meeting rooms and restrooms are located. The second floor, which houses the borough's archives, also is only accessible by stairs. The lack of access becomes an issue when the library hosts programs that interest senior citizens who either cannot use the stairs or have difficulty navigating the steps, said Deborah Griffin-Sadel, library director. "We kind of sit there with our hearts in our mouths as they (visitors) try to negotiate those stairs," she said, referring to the flight of steps leading to the community meeting rooms. 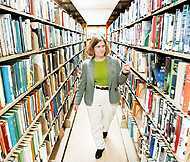 The estimated $1.7 million project to renovate the library to increase accessibility is one of the two last requirements the borough must fulfill in its October 2002 settlement with the U.S. Department of Justice to bring public facilities in compliance with the Americans with Disabilities Act. Among other things, the act requires public entities, such as municipal governments, to provide an equal opportunity to access all programs, services and activities. People who must use a wheelchair cannot navigate some of the bookshelves (above) in the Eisner Memorial Red Bank Public Library (below). Under the federal law, signed in 1990, programs located in inaccessible buildings must be relocated to a facility accessible to people with disabilities. Plans to improve the library, which has not been renovated in three decades, include the addition of an elevator and handicapped-accessible restrooms on the ground floor and rearranging existing offices and resources to make better use of space, Griffin-Sadel said. In the settlement, the borough agreed to update accessibility at its senior center within six months. Within a year from the agreement, changes and improvements had to be made to municipal parking lots, the municipal complex, and Marine and Riverside Garden parks. The borough has until October to make improvements to the library and Count Basie Park on Henry Street. The settlement is the result of a federal lawsuit brought by Carolyn Schwebel, 60, of Middletown. Although Schwebel's complaint pertained to the number of handicapped parking spaces and crosswalk paving stones, the Justice Department launched a full investigation into access issues in borough buildings and facilities. The last two projects will either be completed or substantially under way by the October deadline, Borough Administrator Stanley J. Sickels said. The borough is applying for a $250,000 grant from the county for the $643,705 project to improve the park that includes fields for baseball, basketball, soccer and football. The borough will provide the remaining funds. Of that cost, changes to the bleachers, restrooms and access routes to make the park's facilities ADA complaint will total an estimated $160,000 for construction, engineering and inspection, Sickels said. Sickels said the borough had already initiated plans to improve public facilities before the settlement. The agreement simply sped up the timetable, forcing the borough to absorb the costs all at once instead of spacing out the projects, he said. "People seem to forget that the borough had already initiated a lot of improvements to its facil-ities before the Justice Depart-ment got involved," said Sickels of work done at the senior cen-ter and borough hall. The paver stone crosswalks were not included in the settle-ment but were ultimately re-moved, Sickels said. He said some of the changes ordered in the settlement in-cluded adjusting the height and placement of signs, toilets and urinals by fractions of an inch. The cost of prior ADA compli-ant improvements in the bor-ough could not be determined yesterday. A matter of inches in height or distance can make all the dif-ference in access to someone using a wheelchair, said Schwebel, who is co-chairwom-an of the Equalizers, a group of advocates for people with disa-bilities. Diagnosed with cere-bral palsy as a child, she some-times relies on a wheelchair for mobility. "An inch might as well be a foot," Schwebel said. "A step may as well be 20 steps." While some public facilities, both privately and publicly owned, claim to be accessible, minor flaws in architectural details, such as the placement of a grab bar in a restroom, can block entry for someone using a wheelchair, she said. Schwebel said she would like to see more attention paid to such details in the initial planning stages, not after construction is completed. "Retro-fitting is never as good as doing it right the first time," she said. Schwebel, a retired guidance counselor, said her prior work with handicapped children in-spires her to move forward in her advocacy efforts. "What kind of world are they going to have?" said Schwebel.